Following the success of The Dark Horse Book of Hauntings, Dark Horse returns with another collection of bizarre tales by Eisner Award-winning artists Mike Mignola, Gary Gianni, Evan Dorkin, Jill Thompson, and Scott Morse. Mignola returns with another Hellboy story, and Thompson (Scary Godmother) and Dorkin (The Thing, Dork) return to the characters in their stunning "Stray" story, the surprise hit of the first volume in this series. Morse (Ancient Joe, Sam and Twitch) presents a haunting tale of old Salem, digging into the madness of the accusations leveled there, which ended more than thirty lives in a few short months. 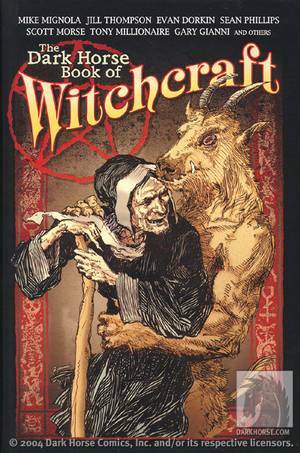 Filled with other stellar comics offerings, as well as a classic witch tale by Clark Ashton Smith and illustrated by cover artist Gianni, The Dark Horse Book of Witchcraft conjures up weird tales of horror and magic the likes of which one seldom sees in the comics medium.